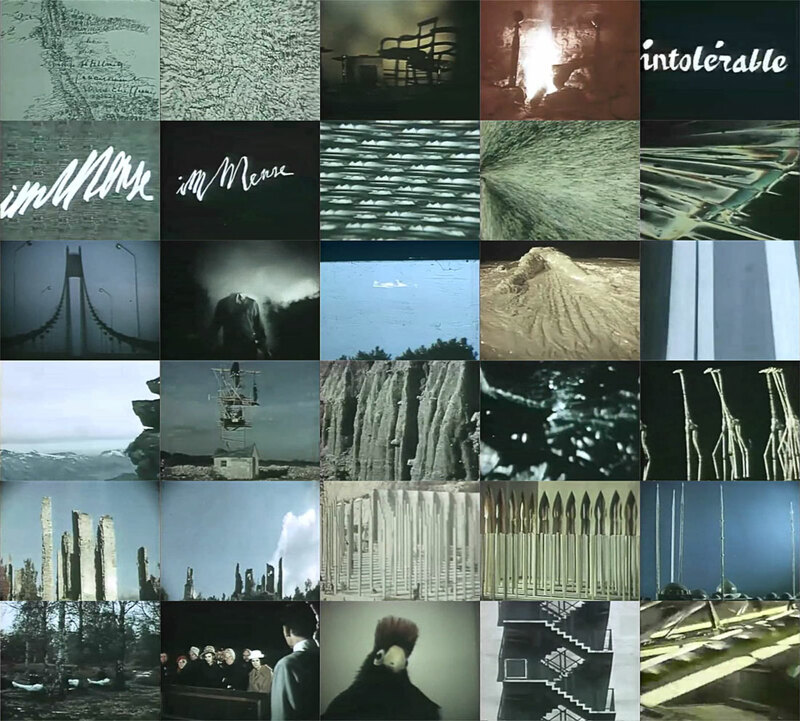 Composite of frames from the film, Images du monde visionnaire, 1964, by the Belgian poet Henri Michaux, commissioned by the Sandoz pharmaceutical company. Click to enlarge. Haunting, too, is Michaux’s emphasis on “the strangeness of natural things and the naturalness of strange things,” as Andre Gide once described Michaux’s philosophy. Like Swift, Flaubert, and Lautreament, Michaux created imaginery lands inhabited by equally chimerical creatures. The royal spider, the Hacs, the Emanglons, and the Gaurs are just a few of the inhabitants in what are considered his best works, including Voyage en Grande Garbagne, Au Pays de la magie, and Ici, Poddema. These creatures are portrayed as being more real than human beings. It’s not an experimental but an educational film which was produced in 1963 by the film department of Swiss pharmaceutical company Sandoz (best known for synthesizing LSD in 1938) in order to demonstrate the hallucinogenic effects of mescaline and hashish. Still it shares many traits with some of the more interesting efforts in avant-garde film making of its time. Maybe the most remarkable [thing] about it is that it is the only venture in film of notable French writer and painter Henri Michaux who wrote several accounts of his experiments with drugs. In charge with the filmic translation of Michaux’ prescriptions was director Eric Duvivier (a nephew of Julien Duvivier) whose other films include an adaptation of Max Ernst’s collage novel La femme 100 têtes. The page from Ombers Blanches is quoted on UbuWeb, where you can also watch the entire 38-minute film. I went through the film and assembled the above composite of 30 images that especially struck me and evoke the flavor of this film. It’s a beautiful film, and no drugs are required.